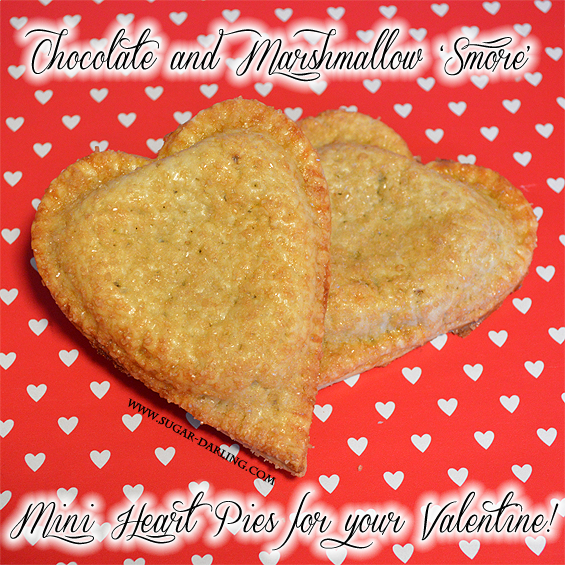 Chocolate and Marshmallow S'more Heart Shaped Mini Pies Recipe for your Valentine - Sugar, Darling? Hi babies! So, as usual, I'm pretty strapped for cash this Valentines Day. February is a super busy month for me with both my little sister and my boyfriend's birthdays, and this month I also have my SIL's hen do and two trips to London so the pennies are definitely tighter than usual this year! Because of this I'm having to be a little smarter with my money, so rather than buy my Pete a present I thought I'd bake him up something delicious instead. The thing is though, that I am super busy with hen do preparations, blogging and revising for my exam at the end of the month so I don't have a lot of spare time, therefore making pastry from scratch or whipping up a fancy cake batter just isn't an option. So I figured to cut down on time I'd whip something up with pre-made pastry. No it isn't a sin to use pre-made, in fact a lot of chefs use pre-made puff as it takes such a long time to make it from scratch, and as long as you use the all butter variety you won't end up with something that tastes like its from Greggs. These little heart shaped treats are filled with a gooey chocolatey, mallowy filling with a hint of cinnamon so they taste a lot like that delicious American treat s'mores which my man is ever so fond of. As it's kinda hard to find graham crackers over here I tried to mimic the flavour by using some of my new favourite Lotus Spread and a shake of ground cinnamon and the results were delicious, but you could mix it up a little and use peanut butter instead or even nothing, although that might make it a little harder to keep the mini mallows and chocolate drops in place as there will be nothing to stick them down with! Kept in an air tight container these babies will last 2-3 days, we warmed them up for a few minutes in the oven before eating to make sure they were nice and melty in the middle - you could try microwaving them too but then you would have a soggy pastry situation, some people like that though so it's up to you! Makes 4, but it depends how big your cutter is! Pre-heat your oven to the temperature your pastry states (it differs depending on the brand) and line your baking tray with baking parchment - a little tip, most pre-made pastries say you should take them out of the fridge about half an hour before you need to use them. Lightly dust your worktop with a little flour and carefully unroll your pastry, then use your cutter to lightly press out where you will cut your heart shapes like you can see in the top picture - this means you can plan where you'll cut so you don't end up with too little pastry, you need two hearts per pie. When you've got it mapped out correctly start cutting for real and remove the excess pastry. Just throw these scraps onto another baking tray, you can bake them up with the pies and have some little pie scrap treats as your cooks perk! Grab a fork and prick holes on half of your cut hearts, then take the un-pricked ones and place them on your lined baking sheet. They won't expand so no need to leave lots of space between them. Next take a tablespoon of Lotus spread or peanut butter and smooth it over the middle of the hearts on your baking tray - don't take it to the edges of the pasted you want at least a 1cm border of plain pastry left at the edges. Now take your mallows and press them into the spread so they stick, you only want a single layer don't pile them up, then pile some chocolate drops on the top. Use as many as you want but remember you'll have to stretch your second pastry tart over them and if the choco-mallow pile is too high it might tear! Grab your beaten egg and brush a little over the plain pastry edges you have left around the filling using a pastry brush or just your finger if you don't have one, and then take one of the fork pricked hearts and carefully stretch it over the filling sticking the edges together. To make sure they stay sealed take a fork and press the tines around the edges. Take the beaten egg and brush a little over the tops of your pies before sprinkling them generously with the demerara cinnamon mix and you're done! Just pop them in the oven until they're gold brown and crisp - mine took about 17 minutes in my fan oven at 180C but as I say, check your pastry's instructions. 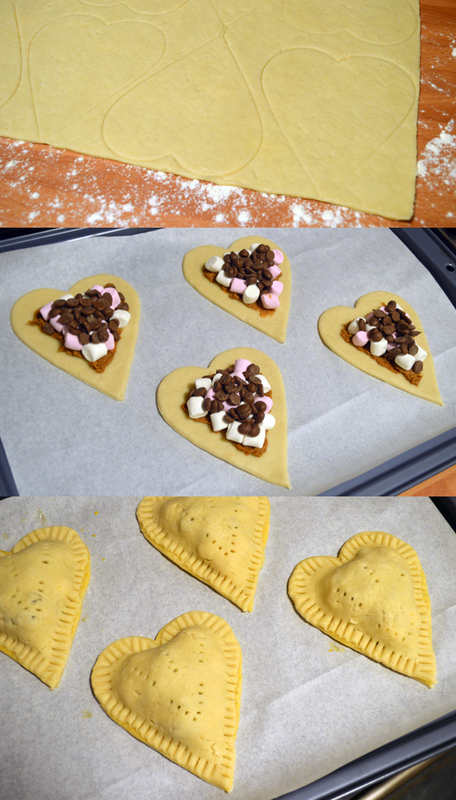 Allow them to cool before packaging them up nicely for your beloved!